The following is from an article in the Bellevue Leader by Eugene Curtin, Associate Editor. May 16, 2018. ​ A full house at the Sarpy County Museum Thursday evening munched hors d’oeuvres, drank fruit punch and celebrated the restoration of an historic artifact. 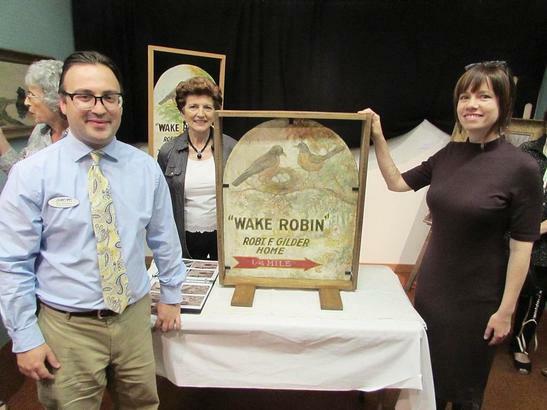 Museum Executive Director Ben Justman, with help of Brenda Carlisle, president of the museum’s board of directors, unveiled the restored Wake Robin sign that once directed visitors to a Fontenelle Forest cabin home and art studio built in 1916 by artist, journalist and archaeologist Robert Gilder. Gilder was a New Yorker who headed west in the 1880s, settling in Nebraska in 1887 and establishing himself as a journalist, archaeologist and painter of Nebraska landscapes whose works are today collected internationally. He worked as a newspaper reporter for 32 years, even as he produced the hundreds of paintings that would become his lasting legacy. Gilder was born in 1856 and died in 1940. Gilder and Wake Robin elementary schools are named in Gilder’s honor. The restoration was conducted by the Gerald R. Ford Conservation Center in Omaha at a cost of $4,500 with funding provided by three Nebraska chapters of The Questers, an international organization dedicated to the preservation of historic objects and sites. The Nebraska chapter donated $3,500, along with a combined $1,000 donation from the La Belle Vue chapter and Bellevue chapter 1504 of the Corps of Discovery, which is a Questers branch reserved for married couples. Rebecca Cashman, the conservator who directed the restoration project, was on hand for the unveiling. She said the project proved satisfying because the sign, while in poor condition, remains important and retained enough of its original artwork to make clear how it was supposed to look. “It’s an object that’s locally important, it was in really bad condition and it was something that not only could we stabilize, which is our first priority as conservators, but we could also make it aesthetically look like it once did,” she said. The sign, which will be displayed permanently at the museum, is part of a larger Robert Gilder exhibit that will be on display at the museum through Saturday. The overall exhibit includes Gilder art works and artifacts borrowed from Creighton University, the University of Nebraska Lincoln, the Joslyn Art Museum and the Omaha World-Herald. The museum is located at 2402 Clay St., in Olde Towne Bellevue.